Morfa Harlech Nature Reserve at Morfa Harlech Nature Reserve (NRW)0300 065 3000work Nature ReserveMorfa Harlech sand dunes structures are arguably the most dynamic form of natural habitat in the world. The coastal walk through the reserve is a dramatic and spectacular sweep of untouched golden sand. At first sight this might appear to be uninteresting as a National Nature Reserve - little but rolling sand dunes covered in marram grass. But it is a genuinely wild place, created by and changing with the forces of nature, not of humans. The dunes here are actively growing with a constant supply of sand being blown inland from the north of Barmouth Bay. The sand accumulates there, having been deposited by the rivers that had washed it down from the mountains of Snowdonia. The land here is rising, not only from accumulation of sand, but because the north west of Britain is gradually rising. When Harlech Castle was built in 1274 it was right on the seashore! Dunes grow first with sand building up around some obstruction such as seaweed or debris on the shore. Once the embryo dune starts growing, specially adapted plants like marram grass can take hold. This grass is deep rooted and can grow rapidly to keep pace with sand that might smother it. Further inland the dunes become more vegetated. Other grasses and a variety of plants adapted to the special conditions of vey dry soil and salty atmosphere grow on them. Morfa Harlech is also a good place for birdwatching, especially in winter when you might see whooper swans and large flocks of wigeon and mallard. Hundreds of curlew and oystercatcher also congregate on the mudflats to the north. 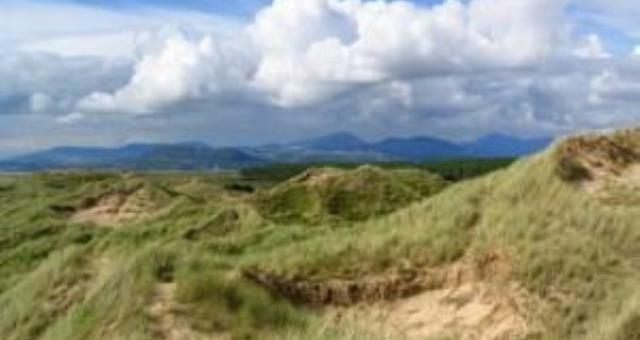 Morfa Harlech is just the northern end of a sand dune system that stretches right down to the Mawddach Estuary. Other parts of this are conserved for their wildlife interest; notably Morfa Dyffryn to the south of Harlech which is also a National Reserve and the small area at Harlech owned by the National Trust called Maes Llandanwg. North of the A487 the Vale of Ffestiniog is flanked by large areas of broadleaved woodland, many parts of which are either National Reserves or owned by conservation bodies such as the National Trust's Coed Cai Fali. The narrow gauge Ffestiniog Railway gives good views of these woods. For a panoramic overview of the area, visit Harlech Castle and look down from the walls on what was clearly sea in the not too distant past. The beach toilets may be locked during the winter months. If so, there are also toilets opposite the turning from the main road to the beach road. Morfa Harlech National Nature Reserve is less than a mile to the west of Harlech, just off the A496. A minor road, Ffordd Glan Mor, leads from the A496 to Min y Don car park which is the main access point for the reserve. The Min y Don car park is run by Gwynedd Council and there is a parking charge. The nearest train station is Harlech. Open only along footpaths to the beach and along the foreshore. Parts of the reserve are fenced off to allow controlled grazing and to protect the specialist sand dune vegetation. Permit required for other parts of the reserves. 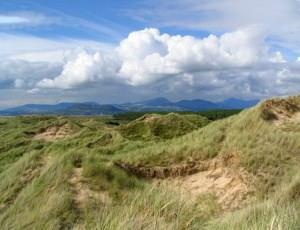 Morfa Harlech sand dunes structures are arguably the most dynamic form of natural habitat in the world. The coastal walk through the reserve is a dramatic and spectacular sweep of untouched golden sand. There are public toilets in Min y Don car park which are run by Gwynedd Council. By Car: The reserve lies west of Harlech on the A496 road between Barmouth and Maentwrog and the turn for Morfa Harlech is almost opposite Harlech Castle. The pay-and-display car park, is at the end of the road and it is just a short walk along a path to the sand dunes and beach. Note - the access path runs across the local golf course, which can be very busy in good weather.